A recent piece by the CBC states credit card debt has spiked among students over the past five to 10 years. However, this conflicts with reports that students are eschewing credit cards altogether. So, what's the real story on student consumer debt? To find out, we asked 820 Canadians born between 1990 and 1996 about their debt perspectives. How much debt danger are Canadian students in? As young adults across the country head back to campus, the issue of students' cost of living -- and the loans they'll require -- is a national discussion. It's argued that steep tuition sets young adults up for decades of debt repayment -- up to 14 years for the average grad, according to our 2012 Cost of the Future study -- and that millennials are effectively delayed from reaching the financial milestones enjoyed by previous generations. Also read: 27.5 per cent of Canadians are in debt denial. Now, it's reported that consumer debt levels are a growing concern for this group. A recent piece by the CBC states credit card debt has spiked among students over the past five to 10 years, heaping thousands in interest on top of already massive student loans. And we've all heard the cautionary tales of students who sign up for cards marketed directly to them, right on campus. However, this conflicts with reports that students are eschewing credit cards altogether. A recent American study commissioned by Bankrate and compiled by Princeton Survey Research Associates International found 63 per cent of millennials don't carry a credit card at all, while another survey found pre-paid credit card use is growing in prevalence among students. Of the respondents polled, 42.5 per cent indicated they don't have credit card debt at all, compared to 18.4 per cent reported for all age groups. Of those who do carry a balance, 41.4 per cent say it's lower than $1,000. Another 22 per cent carry a balance between $1,000 and $5,000. Only 6.5 per cent stated they carry $5,000 to $14,000 in debt and over. When asked what form of debt most troubled respondents, 39.7 per cent said student loans were their greatest source of debt stress. This was followed by credit cards at 29.7 per cent, and lines of credit at six per cent. Additionally, just over half (51.2 per cent) indicate they aren't comfortable with their debt levels. Are Students in Debt Denial? Here's where things get interesting. As it turns out, those in the student age group are in better financial shape than they think. Of the 28 per cent who believe they carry the average amount of credit card debt ($1,000 to $3,000), only 20.9 per cent actually do -- 16.6 per cent carry higher than the average -- and a whopping 61.9 per cent carry less. Of those who think they carry more than the national average (11.5 per cent), only 31.6 per cent actually do. By contrast, those who believe they carry less credit card debt than average (59.8 per cent) are overwhelmingly correct at 93.6 per cent. Don't treat your card like it's free money. Instead, consider it as a loan from your future self (with a big cut going to your bank for the convenience). Using credit to make purchases you don't have cash funds for is the quickest way to build up a balance that's too big to handle. Dining out and impulse purchases topped students' reasons for going into unnecessary debt. "I often find myself using my credit card for school lunches or dinner before work," stated one respondent. Another admitted a Prada handbag was the reason for her debt downfall: "Although I love it... when I think about all the debt I've accumulated over the past few years, I didn't need the bag. I could have lived without it." Interestingly, post-secondary education also made the list of regrettable reasons students went into debt. Of the 19.2 per cent who said they went into debt for unworthy reasons, 13.2 per cent said school had been an unnecessary expense. Using a credit card during your college years is an effective way to build a credit history -- but only if you use it properly. Pay off any purchase made on the card immediately to avoid paying interesting and reap benefits such as rewards and credit-building. Understand the consequences: Racking up a big balance goes beyond big monthly payments - it can cause lingering damage to your credit score. Beware going above one third of your credit limit - doing so raises a red flag to credit bureaus and impacts your score, which can limit your borrowing options later in life. Forty-nine per cent of respondents indicated they preferred a rewards credit card -- but this card type isn't the most student-friendly option. Such cards often come with annual fees -- an unnecessary expense for the budget-strapped. 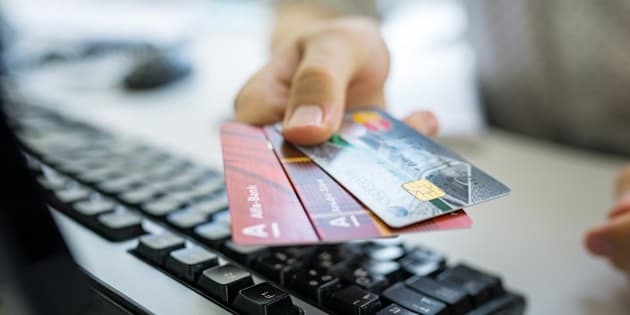 Effective rewards earnings also require regular card use, and immediate balance payoff -- a habit that may be too tempting for those lacking financial discipline. A no-fee option, or competitively lower interest rate, may be a student's best bet. By Penelope Graham, Editor in Chief of RateSupermarket.ca's MoneyWise, Canada's comprehensive financial rates comparison resource.